Mikrotik RB/564 adds six 10/100 ethernet and four miniPCI slots to RB/532, RB/532a, and RB/600. Note: You can not use more than two AR5414 chipset (e.g. R52) cards in RB/564. If you want to use three or four miniPCI cards in RB/564, you should use other chipset based radios for those extra slots, like CM9. For example, two R52 + two CM9 is OK, four CM9 is also OK, but not three or four R52. NOTE: We sold our last stock on these on 4-15-08. 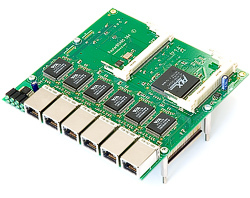 There is no direct replacement, however the RB/493 has 9 ethernet ports and more routing power than an RB/532.